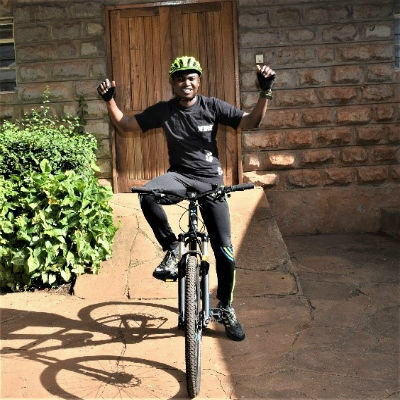 From Friday 15th to Sunday 17th February 2019, David Manoa, Head of Conversation Programmes for Born Free Kenya, will take a new approach to helping wildlife conversation by taking part in Kenya’s 10to4 cycling event. The mountain bike challenge, which has grown in popularity since it was established in 2002, and now attracts over 300 cyclists from all over the world, helps raise vital funds for wildlife conservation and the protection of the Kenya water towers in Mount Kenya’s forest. It starts at 10,000 feet above sea level and sees the cyclists ride over 100kms off-road through alpine moorland, forests and savannah plains, finishing on the savannahs of Borana Wildlife Conservancy. Despite Born Free Kenya supporting the 10to4 event since 2005 through the provision of vehicles and logistical support, this is the first time in over a decade that one of the charity’s employees has tackled the challenge personally. David wanted to secure his spot in the event to highlight the fact that more funds than ever before are required to tackle increasing wildlife conservation challenges such as poaching, climate change, human-wildlife conflict, and rapid growth of human population. To support wildlife conservation in Kenya and David Manoa in his 10to4 mountain bike challenge visit https://www.justgiving.com/fundraising/david-manoa. All proceeds will be split between Born Free and the Mount Kenya Trust.